Yes, you can eat chocolate on the Keto diet! This is one of my favorite things about this diet and why it’s so easy to make a lifestyle change with Keto because it allows you to continue enjoying what you love but approaches it in a different manner. These Keto Truffles are so milky and creamy, and you’re going to love them. But you know me–I’m an overachiever. 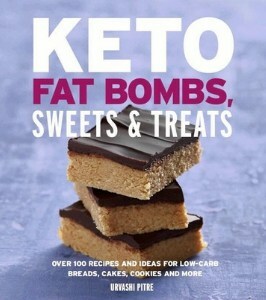 So it’s not enough that they have to be delicious keto chocolate truffles–I had to ensure that they were also a fat bomb because I’m all about #ruthlessefficiency. And of course, since it’s my recipe, you know it’s easy to make and perfect to keep on hand for when you need a little something sweet, or a bump in your fat macros. Three ingredients are all you need to make these amazing Keto Truffles. You need sugar-free chocolate chips, butter, and heavy whipping cream. Three ingredients and a few minutes of mixing are all that stands between you and these dreamy Keto Truffles. Best of all? You can eat them without guilt. This recipe makes 12 small truffles and allows you to eat two truffles per serving. I stick these in the freezer for thirty minutes to set up in the molds, but then just store them in a container in the fridge to eat when I want/need them. Now that I’m thinking about them, I’m gonna go grab a couple out of the fridge now. So one thing that really helped me was using these truffle molds. 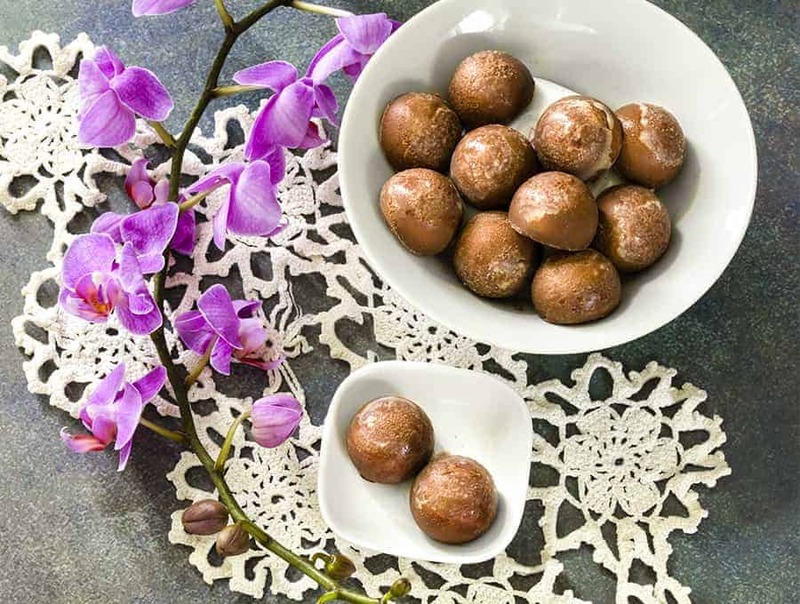 They’re small but they’re perfect and they make truffles that are not only the perfect size and shape, but they are also a great way to ensure portion control. LOOKING FOR MORE TASTY TRUFFLE RECIPES? 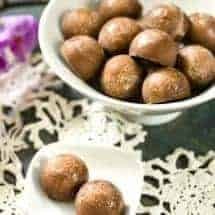 CHECK OUT MY EASY KETO CHOCOLATE TRUFFLES! 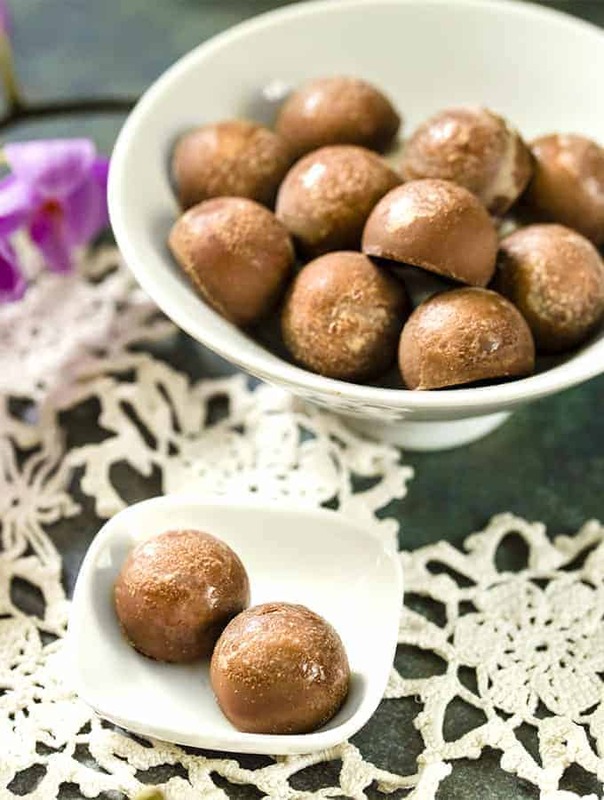 These Keto Truffles are wonderfully sweet, milky, and low carb! And with only 3 ingredients they're super easy to make! Grease a small 12-cup truffle mold (the sort that takes about 1 teaspoon in each cavity). Place all ingredients into a heatproof cup with a pouring lip. I find it easiest to do this using coconut oil Pam spray. Microwave for 30 seconds. Remove and stir well. You want to let all the ingredients melt in the residual heat rather than overcook this mix. If after vigorous stirring for 30 seconds you have chunks of unmelted butter or chocolate, put it back in the microwave in 10 second increments, stirring between cook cycles. Pour into a small 12-cavity truffle mold. Freeze for 30 minutes before unmolding and for an hour until the truffles set. At this point you can remove and store in a covered container in the fridge. This makes 2 small truffles per serving.